Cas-Ker Exclusive! 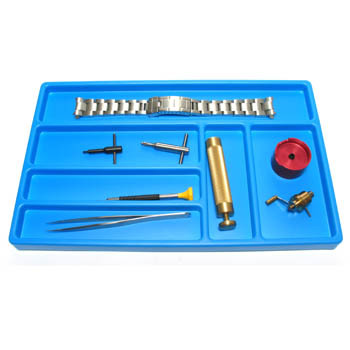 Our smaller tray keeps tools and parts safe in your watchmaker's bench. Six various sized compartments accommodate a number of items. Blue color is easy on the eyes and makes it easy to see small tools. Non-slip feet keep the tray from sliding around. Fits most common benches, 10-3/8" x 6-3/8" x 9/16". Swiss made. This item is typically in stock and ready to ship right away. Order received before 3PM Monday through Friday ship the same day. Allow 2 to 4 days for delivery, or choose expedited shipping options at checkout.